This entry was posted in IT and tagged notizie on December 1, 2014 by FEMEN. This entry was posted in GR and tagged ειδήσεις on December 1, 2014 by FEMEN. This entry was posted in RU and tagged новости on December 1, 2014 by FEMEN. 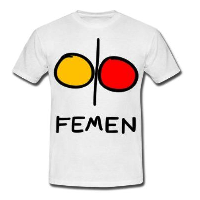 This entry was posted in ES and tagged noticias on December 1, 2014 by FEMEN. Uma ativista do Femen realizou um protesto nesta segunda-feira (1º) em Kyiv, na Ucrânia, contra o sequestro de sua irmã, exigindo que o Serviço de Segurança ucraniano tome medidas para encontrá-la. This entry was posted in PT and tagged notícia on December 1, 2014 by FEMEN.